He certainly did everything he could for the club during his 20-plus years volunteering for the swim club in Bremerton. From seeing it through its transition from school-district sponsored team to USA Swimming club. Giovanni served as board president, board member, timer, official and bookkeeper. On Saturday, Giovanni officially entered the world of retirement. You can read the story I wrote about that here. 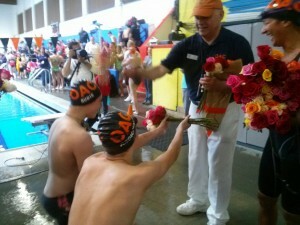 The photos are from former OAC age-group coach Bonnie Burmaster, who is good friends with Nick and his wife, Kathy. 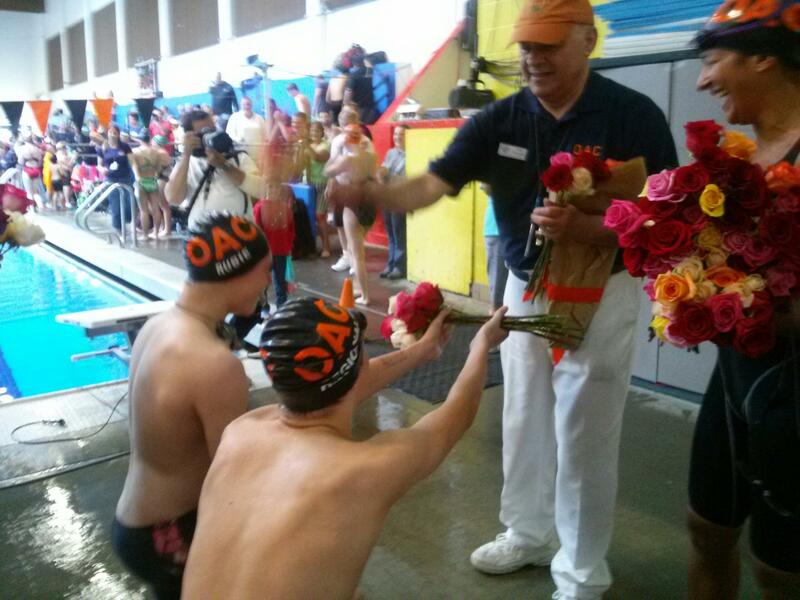 “As a non-profit group, as with most youth sports, OAC has to have volunteers involved with every part of our operation, and this isn’t limited to someone being on the pool deck for a swim meet. Nick’s contribution to OAC has been in every part of the Club’s operation. He has volunteered on our Board of Directors, he has handled the finances for a great number of years and, more visibly, he has volunteered for every job at our swim meets. So, Nick’s experience and knowledge of swimming has been vital to OAC and the swimming community in Kitsap County. While swimmers come and go, and parent volunteers come and go, Nick has been the resource on how to properly get things done. I’ve been volunteering with OAC for over five years. During that time I’ve served on the Board and helped at home swim meets. For every one of those positions Nick is the person that I go to when I need a question answered or I need advice for getting something done. Nick’s contribution to swimming goes well beyond OAC. He has volunteered his on-deck abilities for high school swimming, to OAC and to other teams in our area who are holding events but don’t have a head referree available. To put some perspective around his contribution it can be easily calculated that he spends 150 hours volunteering on a pool deck every year. That’s equivalent of almost a month of working a full time job. Add to that the efforts behind the scenes, that for many years far exceeded his on-deck time, for the last 20-plus years and you realise he has contributed a significant part of his life to this sport and to our community. 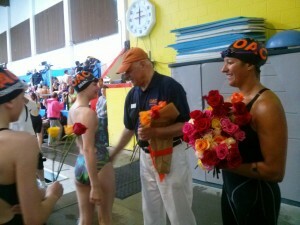 Retiring Nick Giovanni receives flowers from swimmers during the OAC Summer Splash meet in Bremerton on Saturday. Bainbridge Island Swim Club’s Lia Campbell is ranked No. 1 in several events in her age-group in the Pacific Northwest. Campbell, 14, is ranked first in the 50-yard freestyle, 100 free, 200 free, 500 free, 100 backstroke, and is second in the 1,650 free. She’s also ranked No. 5 in the 200 back, 100 butterfly and fourth 200 fly. Campbell is ranked fifth in the 400 individual medley and sixth in the 200 IM and 12th in the 200 breaststroke. Among all age groups, she’s ranked No. 3 in the 50 free. Also, Bremerton YMCA Swim Team’s Samantha Lingenbrink is ranked 23rd in the women’s 200 back. On the boys side, BISC’s Spencer Alpaugh is ranked 15th in the 400 IM and 21st in the 200 fly while brother Sam is ranked 20th in the 200 back. Sam is ranked No. 5 in the 16-year-old category. I missed this meet last month, so I’m playing catch up. Bainbridge Island Swim Club sent 31 swimmers to the Northwest Region Short Course Age Group Championships at KCAC in Federal Way. Alicia Campbell, Sam Alpaugh, Kevin Houseman and Aron Markow all won individual titles. Markow set an age-group record in the 11-year-old division in the 50 breaststroke while Houseman set a record in the 12-year-old division in the 50 and 100 breaststroke races. The meet, which included about 1,300 swimmers from 156 teams in the Northwest, including Wyoming, Alaska and Hawaii. BISC finished fifth overall, its highest finish. Here’s a list of the top eight finishers. Alicia Campbell, 14 year old: 3rd 50 freestyle, 1st 100 freestyle, 1st200 freestyle, 1st 500 freestyle, 3rd 100 backstroke, 5th 100 butterfly. Shannon Campbell, 12 year old: 8th 200 free, 6th 500 free; 11-12 girls: 7th 400 individual medley. Moorea Eldon-Everts, 11 year old: 8th 100 back, 8th butterfly, 7th 200 IM. Margaret Hayes, 10 & Under: 8th 100 back. Sam Alpaugh, 15-18: 2nd 100 back, 1st 200 back, 4th 400 IM. Keenan Grant, 15-18 year old: 5th 100 breaststroke. Kevin Houseman, 12 year old : 1st 50 breast, 1st 100 breast, 3rd 200 breast, 5th 200 IM, 7th 400 IM. Makai Ingalls, 13 year old : 6th 100 back, 7th 100 fly, 7th200 fly. Ian Lipton, 10& Under: 3rd 50 free, 3rd 200 free, 3rd 50 back, 3rd 100 back; 11 & Under : 4th 500 free. Aron Markow, 11 year old: 3rd 50 free, 3rd 100 free, 1st 50 back, 1st 100 back, 1st 50 breast, 3rd 100 breast. Garrett Waite, 13 year old: 2nd 100 back, 3rd 200 back, 5th 400 IM. Jude Wenker, 12 year old: 3rd 200 free. Andrew Witty, 11 year old: 7th 100 back, 5th 200 IM. Here’s what I know from the first couple days of the Speedo Championship Series (SCS) Western Region Meet that is ongoing at King County Aquatic Center in Federal Way this week. None of our local swimmers have made the top 20, but at this point it’s all about progression. Lia Campbell (Bainbridge Island Swim Club): 41st, 100-yard freestyle, 52.29 seconds. Alison Murphy (BISC): 95th, 200 breaststroke, 2 minutes, 29.11 seconds; 98th, 200 backstroke, 2:11.89. Candice Rosen (BISC): 127th, 200 breast, 2:37.36; 185th, 200 freestyle, 2:03.06. Sam Lingenbrink (Bremerton YMCA): 74th, 200 back, 2:07.22. Shayla Archer (BISC): 81st, 200 back, 2:07.95; 164th, 200 free, 1:58.15. Kelsey Crane (Olympic Aquatic Club): 160th, 200 free, 1:58.00. Spencer Alpaugh (BISC): 63rd, 200 butterfly, 1:57.33; 42nd, 400 Individual Medley, 4:09.08. Marcus Tonsmann (BISC): 80th, 200 fly, 1:59.19. I’ll have an update when the meet ends on Saturday.